." Joplin's discography is just as short and changeable as her life. 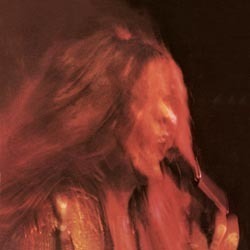 After two LP releases with the standard "cast" of rock musicians in the band Big Brother And The Holding Company, with whose excellent musical support she obtained her first recording contract with Columbia Records in 1968, the company provided her with a group augmented with organ and winds. For those Woodstock fans whose ears are still ringing with the band's full, meaty wind sound and Janis' bluesy soul singing, this album is an absolute must. When Janis Joplin died in October 1970 at t he early age of 27, thus involuntarily confirming the beatnik adage "live fast, love hard, die young," it was only a matter of time before she was crowned the "Queen of Rock." Of greater importance than this posthumous entry into rock 'n' roll's hall of fame is the recognition during her lifetime of her explosive vocal style, which – so Vogue – "turned the whole history of singing upside down." Joplin's discography is just as short and changeable as her life. 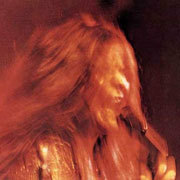 After two LP releases with the standard "cast" of rock musicians in the band Big Brother And The Holding Company, with whose excellent musical support she obtained her first recording contract with Columbia Records in 1968, the company provided her with a group augmented with organ and winds. For those Woodstock fans whose ears are still ringing with the band's full, meaty wind sound and Janis' bluesy soul singing, this album is an absolute must. This underrated 1969 recording was Janis Joplin's first solo studio album after she left Big Brother & the Holding Company. One objection at the time of its release centered on the horn section, which Big Brother loyalists were determined to hate to death. Moreover, the aggregate of musicians backing Joplin — she named the band Kozmic Blues — never solidified as a group, even after earning a warm response on a European tour that spring. There was considerable turnover among the players pulled in for the sessions and considerable discontent as well. Producer Gabriel Mekler would have gladly dumped the band entirely. The best tracks on the album resulted from a single session in June 1969: a supremely delivered rendition of "One Good Man" (with the great Mike Bloomfield on guitar), and, above all, "Little Girl Blue." The Rodgers and Hart estates, however, absolutely loathed Joplin's version of the song, as did a gaggle of older musicians. Joplin changed the words somewhat and made a magnificent tearjerker out of a song that was first performed by Doris Day.